The game of baseball was brought to video game consoles long ago. The total experience - the Pastime - represents the next frontier of simulation, for a public delighted by every stat and detail, no matter how small. This is the direction in which MLB The Show now strives most noticeably. Having nailed the essential acts of baseball, it is refining itself for immersion - either as a player trying to make the majors, or a television viewer who happens to control his team in the field. But as such artistic touches are difficult to measure objectively, and compete with the established brilliance of the series, we're left wondering if MLB 10 The Show is last year's stunning picture painted in prettier colors, or another must-have title. Catching Up: This year, Road to the Show deepens its singleplayer experience by incorporating pitch-calling into created catchers. Trying it out, I was struck by how invested I was in the success of an AI teammate. When I called a pitch whacked for extra bases, I felt responsible even though he's the one who threw it. I'm not sure I've ever played a sports game where I worked this hard on behalf of a CPU teammate, and that's where this innovation truly lies. As a catcher, you're going to have to study the hitters and also examine where and how bad your pitcher is missing in the zone, and with which pitches. In the minor leagues, dealing with raw guys, it can get a little hairy. If you call a lot of stuff in the strike zone, expect a lot of hits, so don't be afraid to have your hurler huck it wide or high. Hitters do chase, and sometimes the pitcher ends up nipping the corner. Really, as Bruce Dickinson says, explore the space. Also, as a catcher, you can do the Pudge Rodriguez thing of throwing down to first behind the runner. Scoring a pickoff this way is nearly orgasmic. I do have a few complaints with the catcher mode, but they do not spoil the experience outright. One is that you don't get much feedback on the effectiveness of how you called the game, other than the damage (or lack thereof) done to the pitcher. Another is how long a game takes, because of the pause the AI pitcher takes between throws. You also don't have any communication with your pitcher. His nods and shakeoffs seem to be preprogrammed gestures. At most he'll make a wind-the-clock motion when you're taking too long to get that signal down. Overall, though, San Diego Studio built a career mode that offers plenty of incentive to try something new - and to stick with it. 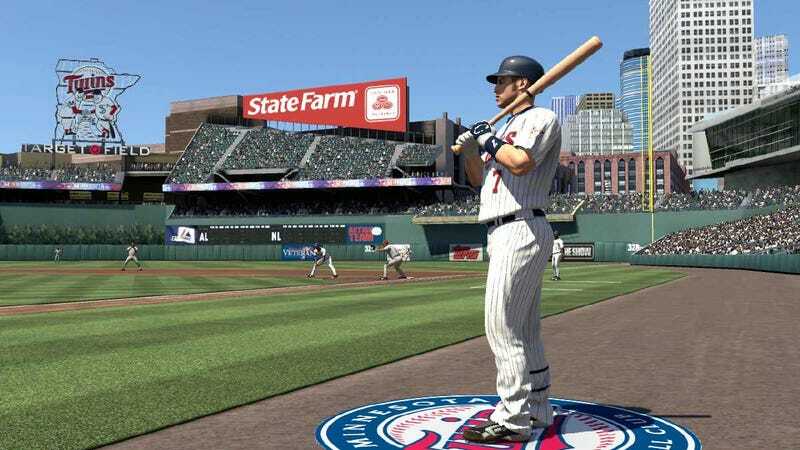 The Very Fine Points: MLB 10 The Show is such a comprehensively detailed game, you'll find yourself in many "Hey, did they have that last year?" moments. The dugouts, for example, are now fully manned in real time, and you'll see them interacting in between plays in ways that aren't just standard cutscenes. (I've read that the game will even show players giving each other hotfoots in the dugout, but I don't know if it has C.C. Sabathia leaning over to tell a teammate "I just farted.") At the end of a play, players don't go into mannequin mode. They greet each other at first base, shake their spikes out and adjust their caps. Fans lean over the railing at foul balls. Boston's Victor Martinez flexes his bicep at each base on a home-run trot. I saw an umpire get blasted by a foul tip and drop to his knees in agony. This isn't core gameplay. But just like doubles off the wall and diving catches, this also is what happens in baseball. Look Into Their Eyes: MLB The Show has always been lauded for its strong visuals but this year, upgraded shading and lighting really brings out some exceptional detail in the players and the textures. I realized, as I was facing Texas' Ian Kinsler in a critical at-bat, that I was staring into his eyes and wondering what he was thinking. Then I noticed his jaw moving and realized he was muttering something to himself. Encouragement? Cursing me? Whatever, it was a remarkable feeling, and it exemplifies how superior graphics become connected to gameplay. Know the Drills: I'm a big advocate of tutorial modes and it's something sports titles don't spend as much time on as they should. MLB 10 The Show does, adding pitching and fielding drills to both offline gameplay and your Road to the Show experience. The pitching drills are a welcome opportunity for skill points and faster advancement, and connect the individual results to specific pitches or skills depending on your success within them. In the strike-zone knockout drill, for example, (throw a ball through eight targets in 15 pitches or less) you can focus entirely on one pitch, boosting both its effectiveness and your control overall. Because some pitch break animations in a live game can be a little subtle, two sessions with your breaking ball can really connect you to its behavior. Fielding drills I didn't spend as much time with, but they're based on correct decisions and reaction time; their usefulness is in training you to take better routes to the ball, especially on line drives. If you played as an outfielder in last year's Road to the Show, you only figured this out the hard way. Screw It, We'll Do It Live: This year the game adds a Real-Time mode to its presentation options and while it's overall a little more subtle than I'd been anticipating, it's still going to be my preferred way to play the game. Real-Time essentially takes all that time between plays and make it productive - the camera follows players as they run back to the dugout after an out, celebrate a home run, agonize over a strikeout, whatever. The only problem I have is that they're done largely in silence - you won't hear commentary until either the replay kicks in (if you enabled the option) or the next sequence begins (a hitter coming to the plate.) But it's much better than watching the game reset with generic animations from a fixed camera position, stuff you're likely to X out of anyway. You don't have to watch all of it, but if you want to take your time and enjoy the game, the Real Time broadcast justifies the decision and even lends some measure of role-playing to the experience. If It Ain't Broke: The game adds tons of functionality but wisely doesn't screw with what makes the whole thing work - realistic, predictive and repeatable in-game action and reactions. There's no new gimmick to how you get the job done - the new pickoff controls notwithstanding, but they're easy to learn and comprise a very specific act within the game. Even the tuning applied to your fielding, meant to deliver more accurate outcomes, simplifies the act without going to a conspicuous onscreen visual. You'll see a concentric meter light up under your guy's feet, but you can also throw by feel, based on how long you hold down the button. In summary, the whole experience will be very familiar to those who spent plenty of time with MLB 09; there's nothing I hate worse than spending a year with a sports game only to jettison some part of that body of knowledge when the next edition arrives. The result is MLB The Show remains a very consistent experience that uses its new versions to deliver polish and detail. That has nothing to do with this game itself, but I did feel like singling out a measure of the franchise's excellence. Minor Quibbles: I have to work to find something I out-and-out dislike about the game, but no one's perfect, not even The Show. There still seems to be a disconnect between your pitching command and the actual result, especially for inexperienced pitchers, even when they aren't in pressure situations. But that's baseball on a pitching meter, with background calculations necessarily overturning what becomes an easily mastered physical act. While we should be grateful for the fielding and pitching drills, baserunning practice should be addressed next year. This game teaches you how to steal second and third (carried over from last year) and that's it; a set of exercises to help you master baserunning in a team-controlled game would be a breakthrough, as switching from a batting task to running the bases is one of the most displacing experiences in team sports sims, and there's no way to improve other than by playing full games. Speaking of baserunning, the bots are always off within a millisecond of bat contact, suffer from no indecision on the basepaths and have a tremendous advantage on the fielders, helping turn innocent mistake pitches into two-out, three run adventures. Batters still don't chase pitches as much as they should, even when set up appropriately, and foul off too many good pitches thrown in the strike zone. Finally, manager and general manager decisions didn't get much of a tune-up. You'll occasionally wander into some real head-scratchers - battering the opposing pitcher for five runs with no mound visit or a warm-up, being left in too long in RTTS, or seeing some screwball "how'd-he-end-up-there" trades midseason. If there is any sports game capable of selling a console, it has to be MLB 10 The Show. Maybe it can't deliver numbers to make analysts sit up straight, but seamheads who want the top-flight baseball sim have to have this game, and for that they have to have a PlayStation 3. Despite being the younger franchise released on one platform, MLB The Show ceased being a boutique product a while ago. And with all that the latest game does exceptionally well, it's apparent that this game truly is the standard bearer for console baseball. MLB 10 The Show was developed by Sony San Diego and published by Sony Computer Entertainment for the PlayStation 3 on March 2. Retails for $59.99 USD. A copy of the game was given to us by the publisher for reviewing purposes. Played all game types in both single and multiplayer modes.